From the tears for fear department... The Cipher @ Red 7 tomorrow night, Oct 29th! Austin, TX- The non-profit organization The Cipher: Austin’s Hip Hop Project, is set to release their new album, Lyrical Lessons, on Friday, October 29, 2010, at Red 7 at 7:00. All proceeds from the event support the program’s mission to empower and inspire East Austin youth through music, poetry and community involvement. A 2007 documentary of the original Hip Hop Project (produced by Bruce Willis and Queen Latifah) sparked the creation of The Cipher. The participants, ages 16-21, meet twice weekly, complete writing exercises, partake in sociopolitical discussions, attend workshops lead by community leaders, and perform live all over Austin. From community events to festivals, The Cipher has appeared in over 85 live performances. Overcoming many challenges, The Cipher members were responsible for and followed through with every aspect of the album: writing lyrics, creating songs and beats, album concept, and marketing and promotions. Through the process, the youth gain confidence in their abilities, higher knowledge, community connections, and many life skills essential for a positive future. The album was produced by Cipher member Micah for RKive Productions and Tmo of Trak Majors. The album was recorded, mixed and mastered by Ter'ell Shahid for Urbanian Entertainment with additional assistance from g. LeDaris for Weighted Keyz. The 19 tracks on the album focus on the experiences of the youth. The Artistic Director of The Cipher is renowned interdisciplinary theater artist Zell Miller III. The organization and production of the album is made possible through continuous community support from Space 12, Southwest Key Programs, Start Strong Austin, mindPop, A Glimmer of Hope Foundation, The Charles and Betti Sanders Foundation, Give Realty, Charity Bash, Swinging Fore A Cause, The Cipher board members and numerous volunteers. Performing along with The Cipher is Gidon, The Outta Kontrol Dance Crew, and DJ S.T.A.T.I.K, with Zell Miller III hosting. 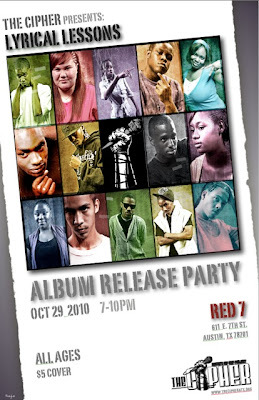 Red 7 is located at 611 E. 7th St. and festivities begin at 7:00pm; $5 cover. The venue is all ages. The album sells for $10 and will be available at the release party, Music Mania, and Waterloo Records. For more information, visit www.thecipheratx.org or contact Shannon Sandrea at 512-917-2714.